Stevie aka The Future Husband and I got hitched on Saturday. Six years, five cases Champagne and 156 witnesses later, I officially became a Mrs. The first day of marriage has been like any other post-party Sunday (sore head, lots of cleaning up and a general feeling of exhaustion) with one notable exception; I actually feel different. I am a strange creature in the sense that I am at once a tragic romantic who believes that love conquers all, while at the same time harbouring a strong nihilistic belief that love is hormonal trickery aimed at perpetuating the species. Gooey romantic Emma is winning the matrimony fight so far. I feel spookily peaceful. And I found two four leaf clovers in the same patch of grass. And I think that guardian angels (I know … go and get your vomit bags) were watching over Stevie and I in a meteorological and somewhat magical fashion on our wedding day. To legally and publicly state that you are committed to someone is a big deal. It takes chutzpah and a willingness to ignore divorce statistics. It takes a hell of a lot of preparation and planning. It takes (for me, anyway), agonising amounts of careful consideration. It’s as though I put Stevie and I’s whole relationship on trial and then had to act as judge and jury just to make sure we were doing the right thing, for the right reasons. Now that we have done it, I feel elated. It’s a similar experience to planning a trip; labouring over bookings and research for months. You can never quite be sure if you’re going to like the new country, if you’re choosing the right airline or if you’re booking the crappiest hotel in the lousiest ghetto. Then you get on the plane and there is no point worrying any more. The journey has begun and you have to let go. That’s how I feel about this new journey with my beloved Stevie aka The First Husband. Tomorrow we get on board a Virgin Atlantic flight to LA for the second day in this brand new adventure of being Husband and Wife. Congratulations & enjoy your trip! Congratulations, I hope you both will be very happy together for many many years to come. I heard the day was beautiful and that all of you scrubbed up very nicely. Have a great time on the honeymoon. Congratulations to you and Stevie. What a magical wedding and so honoured that I was there to witness it. Gorgeous post – I’ve never heard being married described that way and almost makes me want to experience it. Love you Em! I’m a died-in-the-wool anti marriage person – and underneath a hopeless romantic – you both looked lovely and happy and all the best in the future to and for you both. Congratulations Em and Steve – you looked amazing (as always). All the best for a wonderful future together… Can’t wait to see more pictures and of course hear about the honeymoon!! Congrats, Emma! Have a wonderful honeymoon! Yeah Emma and Steve – the photo is beautiful, and I hope the day was too. David and I are on the cruise around the Mediterranean now and strangely, we are going to renew our wedding vows on the ship, with a bit of help from the captain of the Queen Victoria. It will be on the day the ship docks in Santorini, so I’m hoping for some great memories and great photos too. Here’s to being in love, and travelling at the same time. Congratulations to you and Steve!! Sounds like everything went perfectly and you sound so happy. 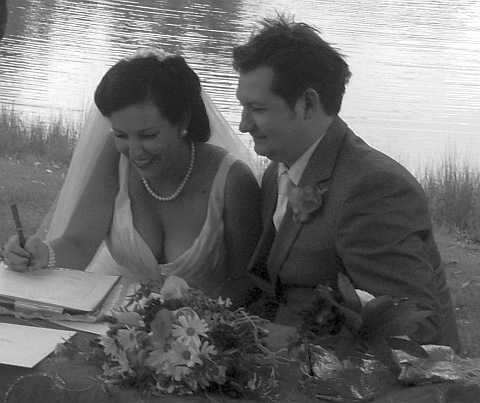 Thanks for posting a photo of the big day on your blog for us to enjoy!! have a great trip and relax!